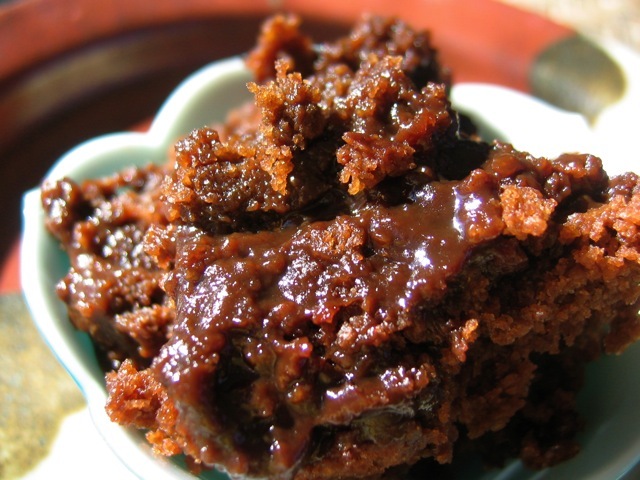 A pudding cake is a definitively American, decidedly homey dessert, in which a cake batter is topped with some sort of syrup and then baked. In the alchemical atmosphere of the slow cooker, the cake part rises up through the syrup, or maybe it's the syrup that sinks down through the cake. But at any rate, the exchange produces a moist, brownie-like cake resting on a swamp of chocolate pudding. To serve it, scoop up some cake with its pudding foundation and eat it with a spoon. Spray a 1½-quart soufflé dish with oil and set aside. Combine the flour, baking powder, salt, ¾ cup of the granulated sugar, and ¼ cup of the cocoa in a mixing bowl. Add the milk, vanilla, and oil, and mix into a stiff batter. Scrape into the prepared dish and smooth the top. Mix the brown sugar, the remaining ¼ cup granulated sugar, and remaining ¼ cup cocoa in a small bowl; sprinkle in an even layer over the top of the batter. Pour the boiling water or coffee over all. Set the dish inside a 6-quart slow cooker and cover the top of the slow cooker with a folded kitchen towel, and then with the cooker lid. Cook on high for 2½ hours, or until the top of the cake is set and the bottom is still syrupy. Cut into wedges or spoon onto plates, using the syrup on the bottom as a sauce. For a more grown-up version, replace half the boiling water or coffee with liquor, such as brandy. Culinate editor's notes: If you don't own a soufflé dish, you can bake this dessert simply by spreading the batter out inside the baking dish of a large slow cooker. (Oil the inside of the baking dish first.) Because the batter is spread more thinly, however, the pudding cake will finish cooking much more quickly, about 1 1/2 hours total. If you don't own a slow cooker, simply arrange the batter and topping in a buttered or greased 8-inch-square baking dish. Bake the cake at 350 degrees for 30 to 40 minutes. Serve with whipped cream on top, if desired. You may also wish to up the chocolate quotient by melting some chopped chocolate (chocolate chips are fine; try 1/2 cup to start) and stirring it into the cake batter or pouring it over the top of the cake.